by Lorraine Siska and David Evans, December 2008. Earlier this year Hotham History Protect members Lorraine Siska and David Evans gave presentations on two 19th-century men and their families whom they had researched — and who had once lived in their respective houses in West Melbourne. DAVID BEGAN HIS TALK with a preface on the early years of North and West Melbourne — two suburbs that developed in parallel, with the first major structure, the Benevolent Asylum, being erected in 1851 and straddling both. As a result of the gold rush Melbourne's population was growing and dwellings were required to accommodate the influx. The first town allotments of land were put up for sale in 1852. These were quickly told with many being subdivided and resold. In North and West Melbourne large numbers of houses were constructed during the latter half of the 19th century but West Melbourne, because of its proximity to the railway, the docks and the commercial centre of Melbourne, also attracted industries, wool stores and commercial premises. This development, which continued into the 20th century, resulted in the loss of many of the early houses, so that by the 1980’s only small pockets of 19th century and early 20th century dwellings remained. It wasn’t until the 1980’s that the heritage value of these old buildings was at last recognized and effects made to catalogue and consent what remained of them. In two of these old homes ‘clues’ were left behind by previous inhabitants, which when slotted into their part of the 'history jigsaw’, helped to unlock the stories of two industrious men, one Welsh and the other of Scottish descent, both proud of their work, their homes, their families and their surrounds. They evoke a ‘sense of place’ in their 19th-century world. These clues are usually found during renovations. They excite curiosity but are often put aside and even forgotten until, sometimes years later, serendipitous events recall them and set you on the path of research to help you complete a story. David’s wife, Heather, found one such clue ashen she discovered a small piece of paper behind the wallpaper in the hallway that the previous owners had left in 1990, detailing their brief research into the house's history. The note explained that this 1881 house was the family home of builder John Jones, who had previously built the three houses located immediately to the south of it in the 1880’s boom period. David, as part of a planning group for the North & West Melbourne Association (NWMA), was aware of Graeme Butler’s North and West Melbourne Conservation Study conducted for the City of Melbourne in 1985. 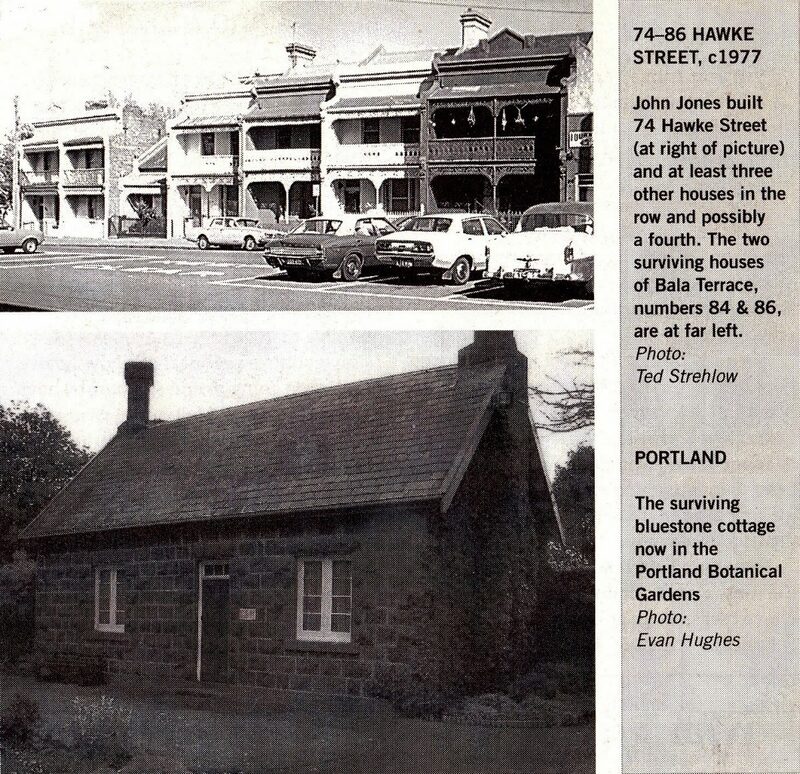 The study confirmed this information as it reported that John Jones not only built 74 Hawke Street but was also responsible for at least three other houses in the row and possibly a fourth. This is where David’s research stalled for several years until he attended a NWMA meeting at which Janet Graham mentioned that she had spent the afternoon transcribing an interview with a gentleman by the named Evan Hughes, who had been born in Hawke Street, West Melbourne, in 1916 and grew up in the house built by his grandfather. Delighted by the discovery that the house under discussion was his current property at number 74, David contacted Evan Hughes, who imparted a wealth of information about the life and work of his grandfather, John Jones. With his curiosity now fully engaged, David began to research many of the West Melbourne houses built by John Jones and delved more deeply into his life story. John Jones was indeed a very industrious builder with over 40 houses to his credit, with another six or so in partnership with his cousin, David Hughes. The vast majority of his work was in West Melbourne, where he also lived with his family. John Jones was born in Pantperthog, North Wales, in 1836. In 1851 at the age of 15 he was working as a wool fuller (a process of making felted fabrics) but at 19 he was working as a stone mason. In April 1856, at the age of 20, he set out from his Welsh village on the long journey to Melbourne, arriving at Sandridge in June of that year. John Jones stayed in Melbourne for a short time and then travelled to Portland to join his uncle. He worked there in partnership with his uncle for a short time. The only surviving reminder of this period Is a bluestone cottage — pictured — now in the Portland Botanical Gardens. Cut into a stone on the bottom left hand corner of the north wall is the inscription JOHN JONES NORTH WALES, providing evidence that this house was indeed built by Jones. This house, then, is probably the oldest surviving house built by Jones and Hughes in Australia. Around 1858 John Jones returned to Melbourne and then headed off to try his luck in the Chiltern and Beechworth goldfields. He seems to have done reasonably well, since, according to an article in the Cambrian Society magazine of 1939, Chinese gold-stealers attacked him, suggesting that he had gold to steal. By January 1861 he was back in Melbourne and this date marks the beginning of his building activity in West Melbourne, where he built two cottages for himself in Hawke Street. 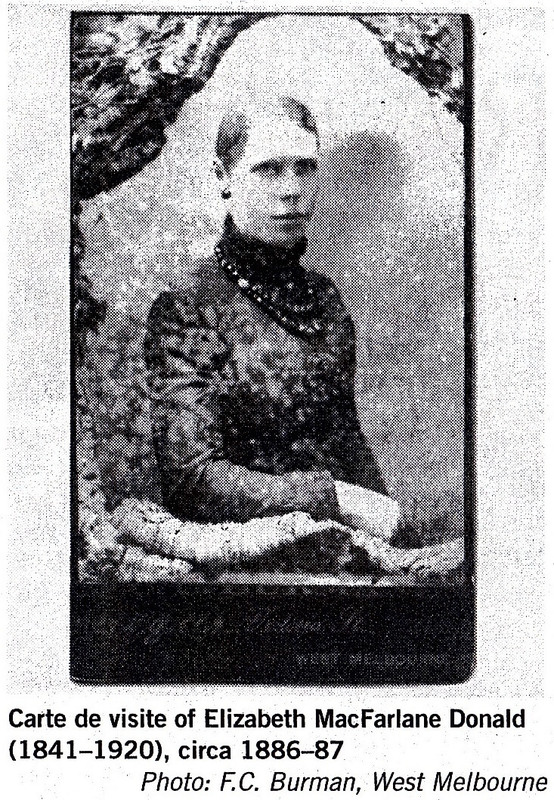 In 1874 he married Margaret Jones, who was also from North Wales, in the Melbourne Welsh Church. They had three children, Dafydd, Elizabeth and Gwenddolen. There are at least 17 surviving houses built by John Jones in West Melbourne between 1874 and 1889, as well as St David's Hall, built in 1893 for the Welsh Church in La Trobe Street. The Welsh Church in Melbourne has a long history and was established in 1852. The present church at 320 La Trobe Street dates from 1871. It wasn't long after the church was completed that the congregation felt the need for a hall for a Sunday school and social occasions. Plans were prepared in 1891-92 by architect S.W.L. Powell. To keep costs down the church became the builder, appointing two members of the congregation with the appropriate experience, John Jones and Robert Jones, to do the work. With patriotic spirit, the church instructed Jones and Jones to hire Welsh tradesmen where possible. The hall cost £815/1/9 and was used for the first time on 1 March 1893 (St David's Day). Appropriately known as St David's Hall, this was the first dispensary and women's outpatients' clinic established by Dr Constance Stone, the first Australian woman to graduate as a medical practitioner. The clinic was staffed by a number of female doctors in the 1890s. This outpatients' clinic became the nucleus of the Queen Victoria Hospital, and a plaque on the outside of the church marks Dr Stone's pioneering contribution to its establishment. 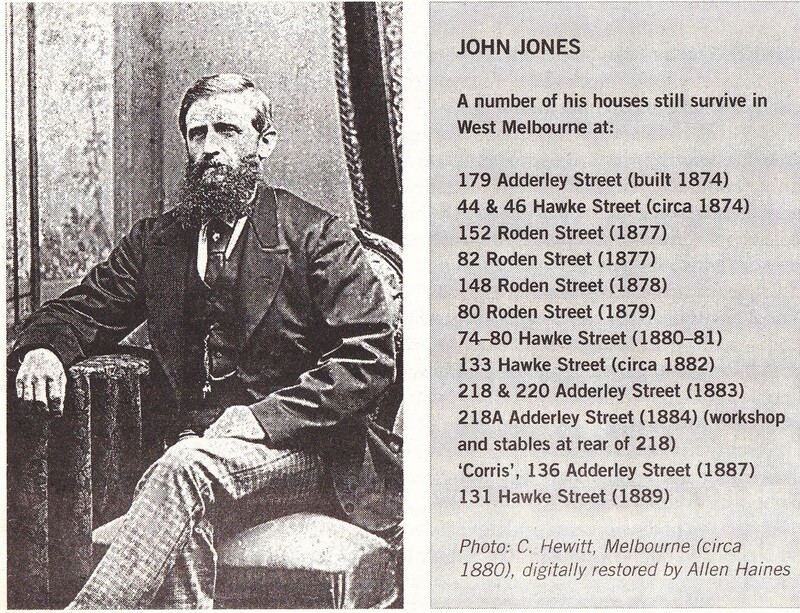 On his death in 1909 John Jones left 11 properties, all in Hawke or Ireland streets, West Melbourne. The survival rate of these houses is not good — four out of 11. There is only one photograph of the lost houses — those at 84-88 Hawke Street, `Bala Terrace' — which were built by John Jones in 1885 and named after the town of Bala in North Wales, from where his wife, Margaret, had emigrated in 1872. All were demolished from the late 1970s. John Jones died some 18 years after Margaret. They are buried together in the Melbourne General Cemetery. His epitaph, written in Welsh, translates as: ‘He did not speak of strength (faith) but he lived his life to the grave with faithfulness.' In his will John Jones left the family home for the use of his daughters until they married. Gwenddolen married David Hughes and she continued to live at 74 Hawke Street with her husband, raising their two sons, John and Evan, until the house was sold in 1954 — a continuous occupation by three generations of the Jones family for 73 years. 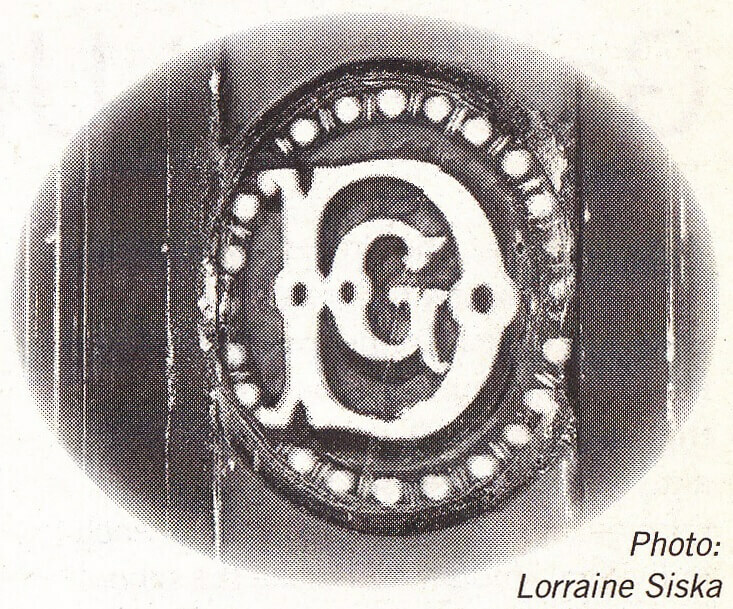 LORRAINE'S SERENDIPITOUS MOMENT came when she realised the leadlight initials DG set in the front-door sidelights (which she had seen every day for over 60 years) were actually the initials of an early owner of her house at 438 King Street. This man had been described in the Melbourne City Council's rate books as an Inspector of Weights & Measures. This meant very little to Lorraine until she read an article, 'More on Inspectors of Nuisances and others', by David Holloway, which noted that in 1885 Melbourne City Council had the largest number of inspectors whose responsibilities were exercised for "the town good". There was the name again: George Donald, Inspector of Weights & Measures and General Markets. Two years later another article shed further light. This one was written by Jenny Carter on 'The business of applying for a job in 1860s Melbourne' and listed references that could be accessed at the Public Record Office Victoria (PROV). Many joyous weeks followed as Lorraine gathered information on George Donald from the Minute Books of the Market Committee 1865-1889 and the Town Clerk's Correspondence Files, Series 1, and she was able to order and read his Reports to Committee and correspondence with councillors ranging over 24 years. To read George's words, written in his own hand, beginning over 140 years ago, evoked a vivid picture of this man and his time and the importance of his work. He was responsible for the correctness of all forms of weights and measures in the markets, of which there were many in 19th-century Melbourne, as well as the weighbridges of the wharves, customs sheds, railway sheds and "every shop store warehouse and shed where goods are sold by weight or measure within the City ...". His reports to the Market Committee from 1864 to 1888 present an interesting picture of an earlier Melbourne and the myriad problems he had to deal with and often devise his own solutions to. These included: the Spencer Street Wharf weighbridge constantly requiring adjustment following damage caused by stormwater depositing silt from the roads onto it; his need for "man horse and harness" to draw his cart and tons of weights; the Western Market traders who laid out their brown onions along Market Street to dry — to the annoyance of the office workers nearby, when the wind blew the skins into their workplace; the bad boys who pelted rotten oranges at each other and around the market after the traders had thrown them into the disused ash pit; the charlatans who set up gambling games at the Eastern Market; and the poulterer in the Fish Market (later replaced by Flinders Street Station) who allowed his ducks, geese, turkeys and fowls to daily sit on the green patch of the Hobson's Bay railway station next door. George Donald appears to have been a very competent and fair man. His integrity shows through his words in a report for 1866 where he made 2079 comparisons with fees amounting to £269/11/10, with 96 seizures resulting in convictions in each case with fines ranging from 1/- to £10/-/-. He adds: "Had I carried the act out strictly. I would have had four times the said number of cases. But in no case did I seize except it had the appearance of gross carelessness or fraud. Those that were not correct were cautioned and I must say in every case they complyed (sic) with the request made in having their weights and machines at once adjusted." George was in his 75th year when ill health forced him to retire from the council. His regret is obvious and the respect he engendered from the Town Clerk, E.G Fitzgibbon, councillors and various lord mayors over 24 years is touching. On 15 February 1888 a report to council recommended that Mr Donald's resignation be accepted and that a sum of E350/ / — equal to one year's salary be paid to him. The alderman of the Market Committee and some of the councillors passed a "high eulogium" upon Mr Donald for his long and faithful service. He died later that year after suffering painfully from jaundice and peritonitis for two years and is buried with his wife, son and younger daughter at the Melbourne General Cemetery. A small photograph, found many years ago behind a mantelpiece during renovations at 438 King Street, provided another piece in the history jigsaw. It is of George Donald's elder daughter, Elizabeth MacFarlane Donald. This was ascertained by researching the very short time that the photographer, F.C. 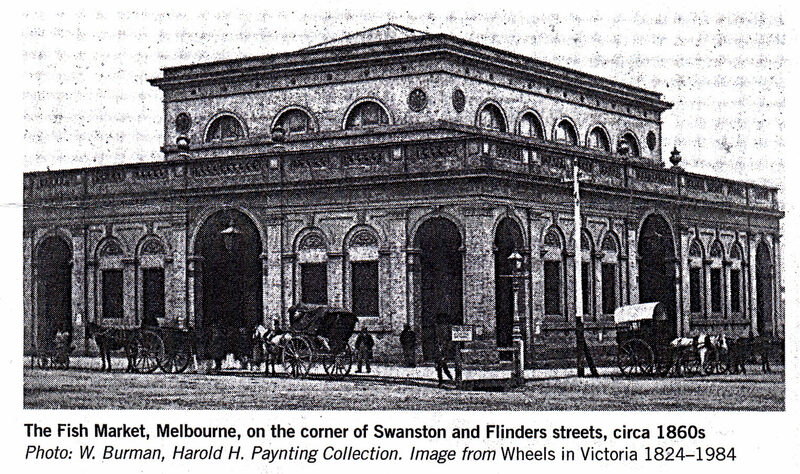 Burman, worked in Victoria Street, West Melbourne; Elizabeth's clothing and jewellery all suggested 1886-87. This lady never married and went to live with her unmarried brother in Were Street, Brighton, in 1896, where she lived on the proceeds of three properties inherited from her parents. In 1920 the income amounted to £3000/1- per year and must have allowed her to live an independent, comfortable life.